Jerry has his own business,Lawrence Productions here in Grand Rapids on Ottawa and Fred Munch another fine musician from the 60’s also works with him. “The End of the Road” is Jerry Brown solo on a 4 track. 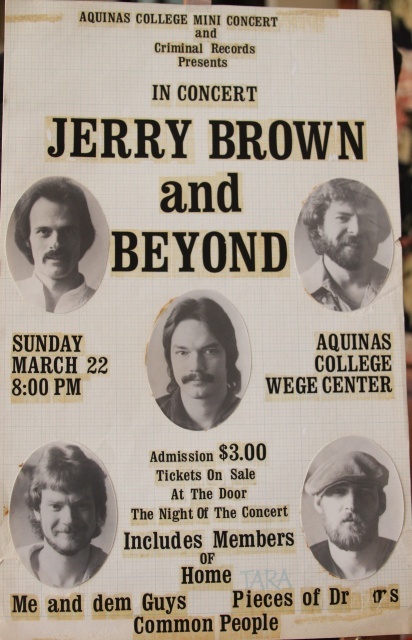 Jerry, I remember listening to you in Kazoo when I was going to WMU. Was that the Whistle Stop where you played? Bill and I wen to Groves High School together. I do not have your old recording. Is there a way to obtain it now and put it on my ipod? Jerry, I was googling your name from a wonder down memory lane and this site was given to me by a person I emailed regarding getting a cd from you or someone that new of the band Home. I was a student at Western in the late 70’s and was a constant fixture at the Whistlestop whenever you guys played there. Do you ever get together with the old members? Those were the best days of my life and your music was a key part of those days! Thanks for remembering. If you send me your address I can send you a CD of my album, which does include some HOME stuff. I will also be posting a lot more music on this site soon as well as many pictures, including a few at the Whistle Stop. Just some clarifications on these 1st mp3s and who are the bands and musicians. “Chain of Life” and “Nothin too Good for You” is Jerry Brown and Friends including me on piano, Mike Roush on Drums, Steve Vandenberg on Electric Guitar, Andy Paul on acoustic guitar, Tom Dunn on upright bass, Virgil Corby on violin and Cheryl Jewel and Jamie LaFerrier on back up vocals. “Somewhere Over the Rainbow” is the 1st incarnation of HOME featuring me on a bunch of stuff, Bob Callner on Guitar, Bill McKinney on Bass and Rick Ducharme on Drums. “The End of the Road” is me solo on a 4 track. “Time Traveler” is the 1st incarnation of Jerry Brown and Beyond with me on acoustic guitar, Larry Cook on Electric guitar, Mike Roush on Drums and Scott Butterfield on bass. I know it’s complicated but wanted the right folks to get credit. These folks are all West Michigan musicians.